Time is running away from me! Most of the week that has gone by I was teaching – and enjoying it. But that means that preparation for the RHS exhibit has been left to one side. Today I am back doing the colour matching with Photoshop. But before I show you a snippet from the next finished picture, I will show you one resulting from last week’s workshop. I am not sure if it is fortunate or unfortunate, but every time I teach I want to do some of what the students are doing. I always need to demonstrate techniques anyway and I am often left with a half finished small picture – depending upon how many there are in the class. In fact, I often find that I continue to work on what I’ve started into the evening. My poor husband! If it is a full class, then all my time is spent either demonstrating or going from person to person constantly. If it is a smaller class, I have to make myself look away from what they are doing so that they can actually start getting something wrong (but not too wrong). I find that if I hang over them too much, they don’t get a chance to do this and then they don’t learn. That is why I prefer to have several students at a time rather than a one-to-one. Although, for some people a one-to-one is essential. 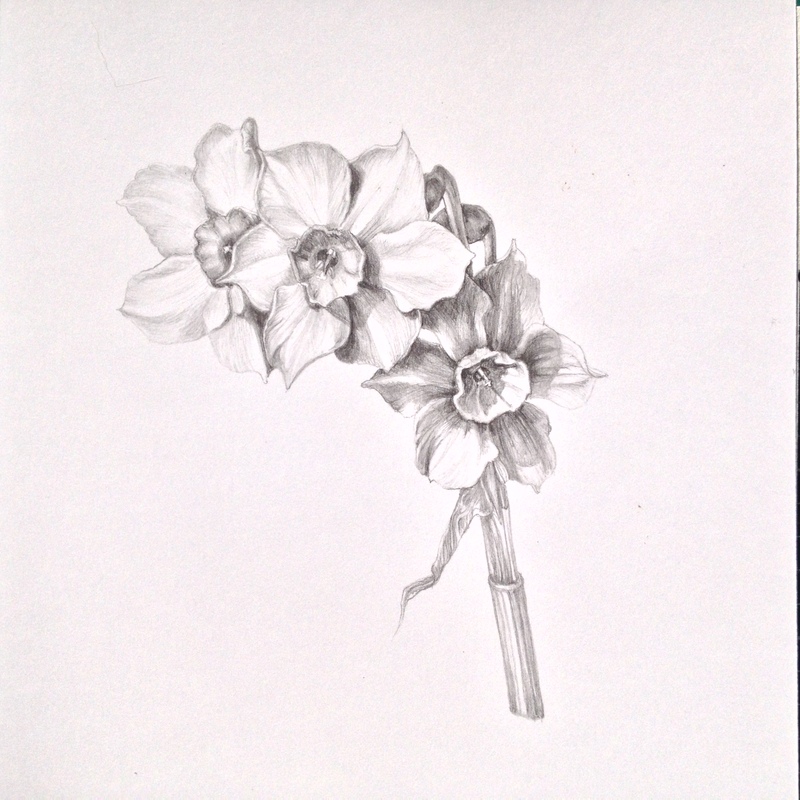 These are Jonquil in graphite. It is a very small picture. I have been asked to give a small picture to a charity, so this will be it. But the next RHS picture ready is Malus Red Sentinel. I think that many people have this crab apple in their gardens as it is quite common. When my grandchildren were smaller they called it a ‘tomato tree’. If you have been following this blog, you will know that we now have several ‘tomato trees’. Make a note of the new leaves on this crab apple. They often have a slight red tinge round the edge when new. The flowers are fairly simple showing up a pale pink. Although on a bright Spring day against a clear blue sky they look really exotic. 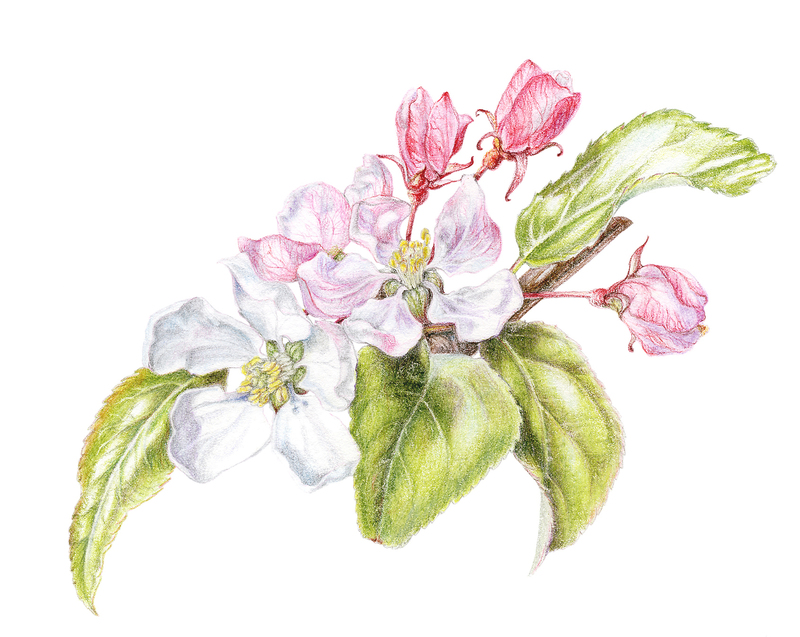 < From Sketching to drawing – learn to draw botanical images workshop. What a sensible approach to your tutoring, to give them the space to go wrong, but not too wrong. My last tutor was so right when she said that painting was just problem solving. So, if you don’t give your students time to try to solve their own problems, they are not going to learn. Hei Anne, I’m glad it isn’t just me who thinks and teaches in this way. The colour matching is done on Photoshop. I have learnt how to do this so that I can make my own prints. I struggled for ages to find a printer who would spend the time to do it properly, but needed the work done and therefore did it myself. Since I started, I have found someone who can do it, but only use them for work that is larger than I can handle on my equipment. In addition to a good computer, I also have a really good scanner and a printer with archival inks. Your work is so lovely. I’m so glad I came across your blog while looking for jonquil images. I’m really looking forward to your updates. Thanks for sharing photos of your work here. Also, do you mind telling me what brand(s) of colored pencil you prefer? Thank you. The basic ones that I work with are Faber Castell Polychromos. But in addition to these I will use a few Caran d’Ache Pablo pencils ( which are a lot softer), a ver few pale Derwent Artist (harder), Prismaclour Verithins for tiny detail and the very soft Luminance and Prismacolor. The last two I generally only use for finishing off, but not always. As you see I use most makes, with each other, but the basic brand is Faber Castell. They are all dry so that I can have very fine points and paint detail. I hope this helps. I have a full set of Polys and love them! The other info you gave really helped too. Thank you very much!